Tanner just celebrated his 7th birthday. He had a full birthday weekend which started on the eve of his birthday at his favorite chinese restaurant. The next morning, his birthday, was greeted withbreakfast in bed. 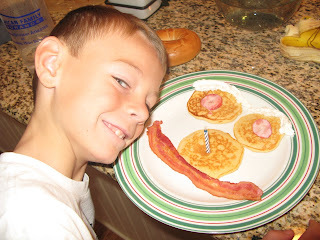 He was served pancakes, bacon, strawberries, and whip cream in the form of a smiley face. Mom added a trick candle in the middle of the pancake nose. 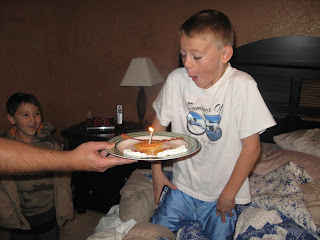 Tanner was fooled as he tried many times to blow out the candle. We all got quite the kick out of it. His close guy friends, Drew, Josh, Jeremiah, Jake, and Tyler arrived shortly after breakfast. We had a little set back at the field house because they did not have space for us. Mom was especially sad because she had gotten a baby sitter to watch the girls while she run around with the boys. Thankfully we persevered and found the nearest church building gym to be empty and began a good game of basketball. We were kicked out after 30 minutes and so we returned home. We played a volleyball game (yes...in the house) , made slime, and shake and make vanilla ice cream. 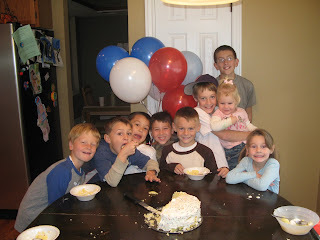 All the kids loved the ice cream and especially loved that we were able to eat the cake and ice cream before the pizza. After the party we headed to Blake's basketball game. On our way home from the game we dropped off Mike and Tanner at batting practice. We picked them up and headed for Monkey Business to join a birthday party the whole family was invited to. It was a cold winter night and Mike helped a stranded car get off the median. Once we were back in Stonegate we drive around and looked at Christmas lights. At last it is Tanner's actual birthday. We headed off to church where he was sung to in Primary. After church we played in our backyard and built a fort in the snow. Tanner and mom went to a baptismal preview to talk about Tanner's baptism which is now only 1 year away. After the preview they drove around to look at Christmas light again. I cannot believe he is 7 years old. It seems like just yesterday I was at the baby shower honoring his uproaching birth. I love my little Tanner fanner fo fanner so incredibly much. I am so especially grateful for his loving heart and honest spirit. happy birthday tanner man.looks like you had a wonderful day and a fun party. What a fun time. I can't believe he's 7! Sorry we missed the party!